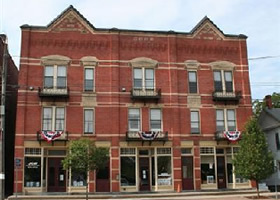 JGB Properties lovingly restored and rehabilitated this stunning historic building in 2004. Several beautiful, light-filled apartments in excellent condition are now available for rent. For more information or to receive a rental application, please email gladstone@jgbproperties.com. Rent includes heat and water, but not electricity. Furnished units are available for an extra fee. Local bus service to Cooperstown and Oneonta as well as frequent service to New York City is available. Banks, churches, supermarket, drugstore and pharmacy as well as post office are with in walking distance. The village has an excellent library and the Basset Clinic is nearby. Spring Park that houses the famous Village Clock provides walking paths and benches and in the summer is the location of evening concerts and daytime exhibits. Beautiful Canadarago Lake is moments away.